Generally these days I stay away from more 'basic' vegan cookbooks. Not a slight on them, I just have so many cookbooks now that I don't really need the same recipes over and over again, I look for something with a bit of a different take. But I saw some reviews on other blogs about The Easy Vegan Cookbook by Kathy Hester and it looked like it had some interesting recipes. Though once I got it, I found it hard to get inspired and I didn't anything for ages. I have made a few things, and there are definitely some more I want to make. I haven't done a round-up from this book before, but I did make some blondies from it for a bake sale once. Maple Walnut Sausage Patties: Breakfast sausage isn't really a thing here in Australian (sausages at breakfast, yes, but not in the US sense). 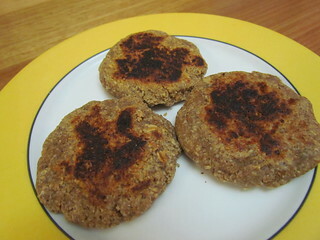 So this recipe is actually really handy as a fast way to make some breakfast sausage patties. I wanted them for some breakfast sandwiches, and a 1/2 recipe made three biscuit-sized patties. The recipe says it makes 16 sausage patties, so I imagine they must be very small. These were fairly sweet, so you may want to cut down on the maple a smidge. 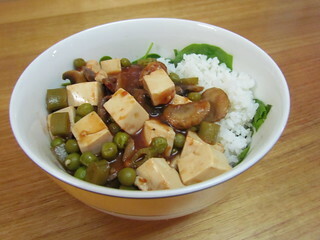 Mapo Tofu: I had some leftover silken tofu to use up, so I made a half batch of this recipe. Of course, I cut way back on anything spicy to just a teeny smidge of sriracha. Although I made a reduced amount of the solid ingredients, I still made the full recipe of the sauce because I like things saucy. This sauce was really lovely, tangy, and gingery. Served with some rice and baby spinach, I got two serves. 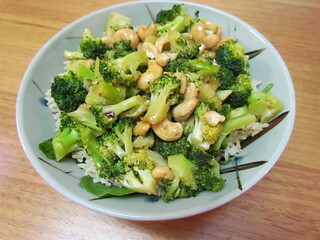 Broccoli with Spicy Garlic Sauce: This vegetable based stir-fry claims to serve four, but I got only two serves from it over rice. I added some cashews as well, and I think some tofu would be a great addition. I made the sauce not spicy by leaving out the chili flakes. The sauce was a little sweet because of this, so I might decrease the amount of agave if you are taking this route, but it was nice and made plenty. Ann's Vegetable Fried Rice with Tofu: The reason this looks so dramatically dark is because I used dark soy sauce, which made everything very very moody. But it was still a delightful dinner. 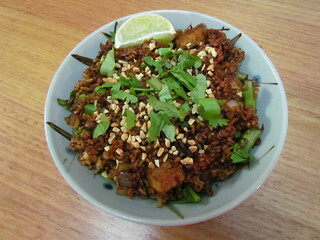 I used brown basmati rice as my base, as that is what I had leftover from another dinner. I replaced the capsicum with grated carrot, and used 2 packs of the Soyco Japanese marinated tofu that I love. I also cooked the scallions with the onion rather than adding at the end, as raw scallions don't always suit my tummy. 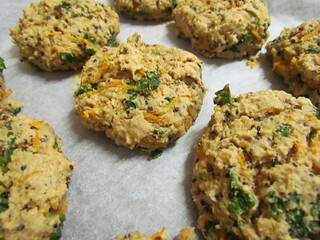 Veggie Quinoa Drop Biscuits: When life gives you leftover quinoa, make biscuits. This recipe calls for 1/2 cup of either vegan butter, shortening, or coconut oil. I used a jar of vegan onion lard (that didn't have any coconut oil) that I got from a Cruelty Free Shop mystery box for this, as I needed somewhere to use it. These biscuits are very tasty, but also quite soft (maybe because of the lard?). I also froze some of them and, after defrosting, reheated them at 180dC in the oven for 20 minutes and then they went very crunchy! 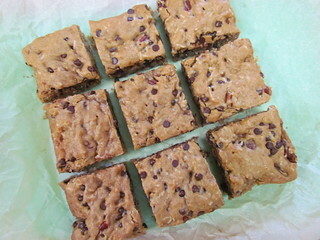 Pecan Coconut Chocolate Chip Bars: I made these fun bars for a bake sale. The recipe calls for 1/2 cup melted coconut oil, or apple puree for an oil free option. I used slightly less than 1/2 cup of canola oil (mainly because I couldn't be bothered melting down margerine). The recipe calls for whole-wheat pastry flour, which can be hard to find here, so I used a mix of wholemeal spelt and regular plain white flour. The batter has pecans, chocolate chips, and shredded coconut mixed through it (I added some extra coconut). While I do have a mixer, which the recipe is written for, I did it by hand and it was easy and fine. I did need to bake it for an extra 5-10 minutes, though that is not unusual in my oven. 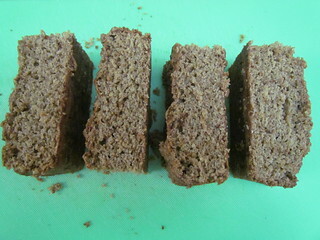 Applesauce Spice Cake: I made this for some work snacks. The batter, which includes a hefty amount of applesauce as well as a lovely mix of spices, tasted amazing! Unfortunately this was lost a bit once it was baked. It was still good, but I expected more from the batter. I didn't have a 9 inch cake pan, so I used an 8 inch one. I was expecting it to rise a lot, as the recipe calls for a tall pan, but it didn't rise much at all and was quite dense. Dim Sim had surgery yesterday. Last week she had her senior check and vaccination. 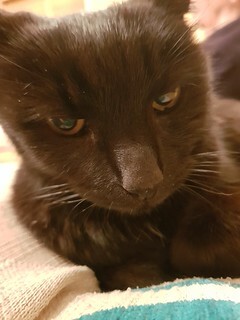 Thankfully her blood results came back showing that her kidney disease is pretty stable, but she had two skin lumps and cytology on one came back as a mast cell tumour. Yesterday she was the bravest girl, and had them removed with just sedation and a local anaesthetic. Hopefully the results will come back from the lab showing clean margins, otherwise she will need to have a full GA to cut out more. So fingers crossed! I have my fingers crossed so hard for Dim Sim!!! Sending all the positive thoughts your way!!! Glad at least her kidneys are being consistent. Good luck with the other tests.